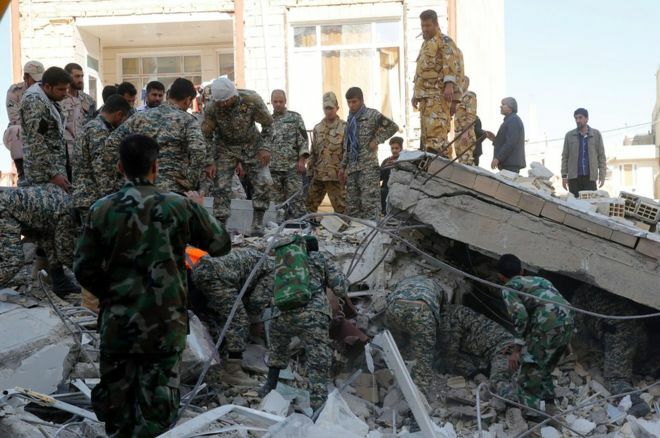 About 400 people may have died following an earthquake in a border area between Iraq and Iran on Sunday, rattling Iraque residents just about to start recovering from a long period of war . The sudden earthquake, soon after news reports of an end of war, is making people to ask if indeed war has ended in iraq. When news reports said last week that war had ended in Iraq, observers wondered whether the people of Iraq had actually seized to be a victim of circumstances beyond their control. The ink in the news reports about the end of war in Iraq had hardly dried, when another reports said another war may be brewing between Saudi Arabia and Iran. Observers then contend that if there will be war between Saudi Arabia and Iran, Iraq cannot breath a sigh of relief yet, because it is still in the same region, and the country can be affected by any shooting war between Saudi Arabia and Iran. Just like it happened when the ISIS in Syria decided to get a part of Iraq to establish its power. And just as protagonists in the debate of Iraq's fate were busy trying to unravel the evil fate in the Middle East about endless wars, an eartquake struck underneath the earth. The 7.3 magnititude quake in a mountanous region of Iraq and Iran is described as the deadliest in the region in 2017, according to the BBC. There is seeming lack of clarity over the number of casualtly from the Sunday quake with digging of the ground to determine the actaul number of the dead, and if there people alive buried alive underground. War is trouble, big trouble. Just like earthquake also depicts big trouble. Both are killers of no mean dimension that no human society wishes or prays to have. No one knows what will come next after the earthquake. Will peace eventually become Iraques' lot after long years of witnessing carnage upon carnage? When the war began in Iraq in 2003, most Iraques had no power over what events in their country. Saddam Hussein took them into a losing and destructive war. The country hardly recoevred from the war, when the ISIS smarted into Iraq from Syria, in search of a foothold to continues its deadliness in the region. When will the Iraques see an end of the bloody existence in their country?